Slayer frontman Tom Araya still can’t get used to working without late guitarist Jeff Hanneman, he’s admitted. The band are in the process of mixing and mastering their 11th album – their first without the co-founding guitarist, who died in 2013 after a two-year absence with health issues. 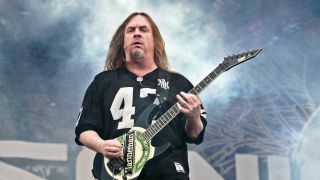 It was previously revealed that one track on the follow-up to 2009’s World Painted Blood was written before Hanneman’s death, and features his playing. A total of 13 songs have been laid down by Araya, Kerry King, Gary Holt and Paul Bostaph, although it’s likely only 10 will appear. Slayer have still to decide on the album title, artwork and other details. Araya reflects: “Ever since Jeff’s passing it’s been just odd and strange – because he’s never going to be there again, you know? It’s expected later this year. The band appear on Motorhead’s second Motorboat cruise in September.